Pine trees (Pinus spp.) are the most common coniferous tree worldwide, numbering around 100 species. These trees form large forests characterized by wide open areas with sunlight spilling to the forest floor. Pines are sun-loving trees that do not grow well under shady conditions. Most of these trees live in the Northern Hemisphere, except for the Sumatran pine (Pinus merkussi) surviving south of the equator. These conifers are considered evergreen, which means that they keep their needles for at least two years. As the older needles fall, new ones are ready to grow in their place. Bristlecone pine trees (Pinus longaeva) keep their needles for at least 30 years. Pine trees produce long, narrow needles 1 to 11 inches long. For example, longleaf pine trees (Pinus palustris) grow needles 9 inches long. Pine needles range from blue to dark green and are bundled into groups of two, three or five needles. The needles connect near the point where they attach to the branch. Needles hold the key to breaking the pine tree types into smaller classifications. Needles bundled in groups of two belong to the lodgepole pine group (Pinus contorta). 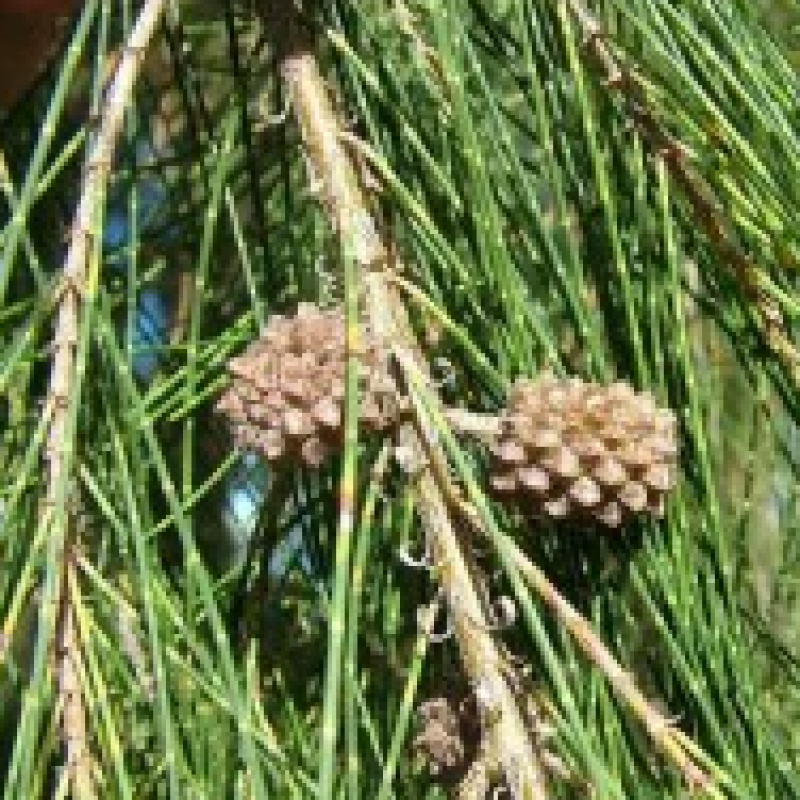 When needles are in groups of three, they originate from ponderosa pines (Pinus ponderosa), Jeffery pines (Pinus jefferyi) or knobcone pines (Pinus attenuate). Western white pines (Pinus monticola), sugar pines (Pinus lambertiana), limber pines (Pinus flexilis) and whitebark pines (Pinus albicaulis) grow needles in bunches of five. Large woody cones are a key element for pine trees. Both female and male cones appear on a tree. The female cones produce seeds, while the male cones drop pollen. The pollen is carried by gravity or wind to the female cones, fertilizing the seeds. Sugar pines produce cones 10 to 20 inches long. Most pine trees produce lateral branches in large whorls running up a straight trunk, which make the tree easy to climb. The bark covering the trunk and branches flakes off with large scales. The pine tree releases a strong pine scent when disturbed or overheated. Pine trees reach a range of mature sizes that depends on the species. The dwarf mugo pine (Pinus mugo pumilio) grows to a mature size of 4 feet tall, while slash pines (Pinus elliottii) reach 100 feet. White pines reach up to 150 feet tall, growing only 8 to 12 inches a year, when planted in favorable environments. As a group, pine trees are long-lived conifers. Most varieties live over a century when growing in favorable conditions. Bristlecone pine trees are known to live at least 4,800 years.